I went to get my yearly check up at the doctor this past month and after getting my results, the doctor asked: Are you sure you have PCOS? So I thought of uploading another health update about how I cured my PCOS. Those are the EXACT words you want to hear when you go for a check-up!! Boy, was I glad I heard them. 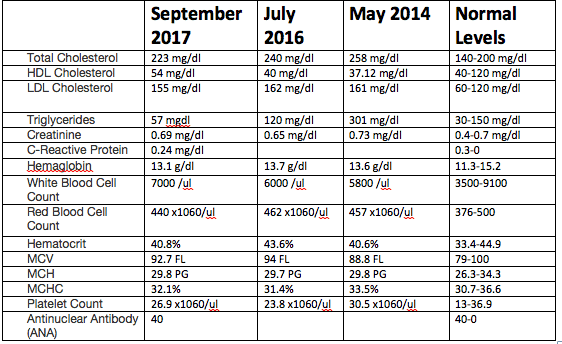 I posted a health update with my latest test results last year (2016) and my results from this year’s check-up were even BETTER!!!! It’s officially been 2 years and 9 months that my PCOS is in remission! Before I get into the details, this is what I do. I ride my bike everywhere under 15km. I take a cardio kickboxing class every Saturday. I do weight training once or twice a week at the gym. I do some light exercises or HIIT training in the morning if I wake up early. I do Intermittent Fasting. I eat from 12pm-8pm and fast from 8pm-12m. I started this in July. I do not eat gluten or sugar. I eat soy (only organic and fermented) and dairy on a weekly basis. I try to eat as much organic as I can afford (depends on the week). I eat low carb ranging 20g-40g/day, if I go out it’ll usually go up to 60g. Under 20g gives me the keto rash and my hair falls out like crazy. I dealt with the rash for 2 months and it was too much so I upped my carbs. I do not eat packaged food, instant food, processed food, or GMO products. My main source of food is meat and veggies with lots of healthy fats. The fats that I eat include: nuts, dairy products, avocado/coconut/olive oil, lard/beef tallow, avocado, coconut butter, seed/nut butters. I do not eat corn, potatoes, beans or lentils. But I do (maybe like once every 4-5 months) eat sweet potatoes, butternut squash, beets or plantains. This is usually when I create a paleo recipe for the blog. The sweeteners I use are mainly stevia, erythritol, and monk fruit. I do have raw honey in my pantry, but only use it like once a year for soar throats and teas. The flours I use for baking include: nut flours, coconut flour, oat fiber, xanthan/guar gum, glucomannan powder, whey protein isolate, and psyllium husk powder. I eat fruit from time to time, maybe twice a month. I eat berries multiple times a week. I’m not going to lie, I do have occasional cheats like sushi (maybe once a month). I love to drink milk from nuts. I also make smoothies with coconut milk and cream. This year, I wanted to check a whole lot of things so I had multiple tests done and one new test that I had never done. All of these tests, except for the LH-RH test, were covered by my insurance in Japan. I couldn’t get my androstenedione checked as it wasn’t included anywhere in the insurance and they couldn’t find it. I’m guessing people don’t test that in Japan because it wasn’t in their computer and they didn’t know what I was talking about. In Japan, they also don’t test the Free Testosterone, only the Total Testosterone. I had never heard of the LH-RH test before, but the doctors in Japan seem to use it a lot to see if there are any problems with our pituitary gland and ovaries. They inject you with a single dosage of 0.1mg Gonadorelin which is the same as the GnRH (gonadotropin-releasing hormone) that is naturally released from the hypothalamus gland. The GnRH causes the pituitary gland to release the LH and FSH hormones. So the gonadorelin is used to test how well the hypothalamus and pituitary glands are working. With the test results, the doctors can see whether a female is ovulating properly or if the hormones/organs are functioning as they should be. They also use this test to see if teenagers are going through puberty correctly. It cost me about 140$ without insurance. I had to go to the doctor multiple times over the course of September to do different tests depending on where I was in my cycle. During my first visit, I did the yearly pap smear. I also wanted to do hormone tests, but I had to wait until I was on my 3rd day of periods, which was September 6th. On September 6th, I went back to the clinic and the results from the PAP smear were back. No problems found. The nurses took a lot of blood from me for all of the hormone/health tests I requested before doing the LH-RH test. For the LH-RH test, they made me lie down on the bed and told me I would feel dizzy once they injected me with the hormones. They took my blood before injecting me, and then injected me. It was honestly the weirdest feeling ever. My brain felt so dizzy and my eyes were spinning. I could feel the liquid go through every part of my body, especially in my stomach and in the end in my ovaries. I had to stay lying down for a good 5 minutes before getting back up because I felt like I was going to faint. 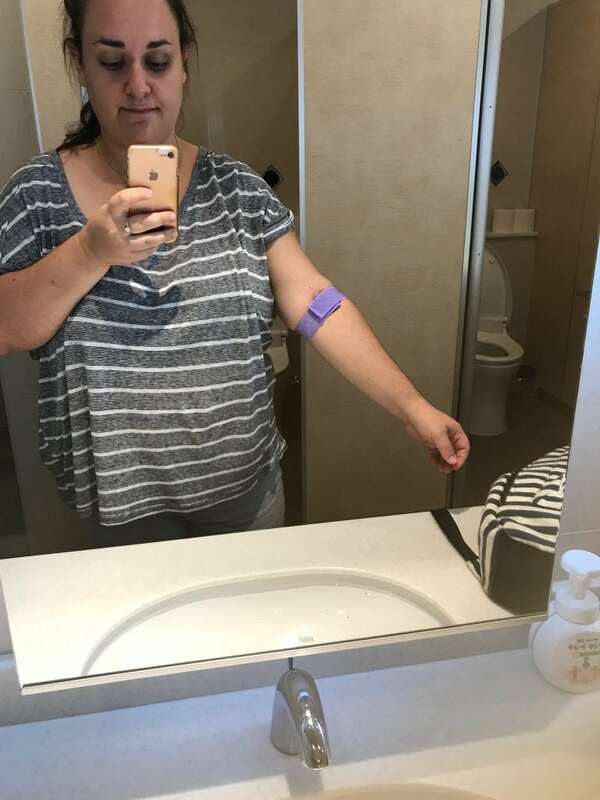 After 30, 60, and 90 minutes, they took other samples of my blood to see if my brain and ovaries were dealing with the hormones injected in me properly. After that was done, I got to go home. I noticed a few side effects the following week including dizziness and headaches. He also warned me that I may or may not get my periods earlier. Only 1% of people get their periods earlier. The following week, on September 15th, I went to get my results back. We also took an ultrasound to see if I had any cysts. My left ovary had no cyst and my right ovary had 2 small follicles and one huge main follicle. The doctor said I should ovulate soon from my right ovary. The left picture is my right ovary with 2 small follicles and 1 big follicle about to burst for ovulation. The right picture is my left ovary with no follicles/cysts. As for the tests, well here are the results below! My cholesterol improved again this year, especially my triglycerides. My HDL increased a little and my LDL decreased a little, which made my total cholesterol also decrease a little. My blood sugar was normal and my insulin also dramatically decreased! 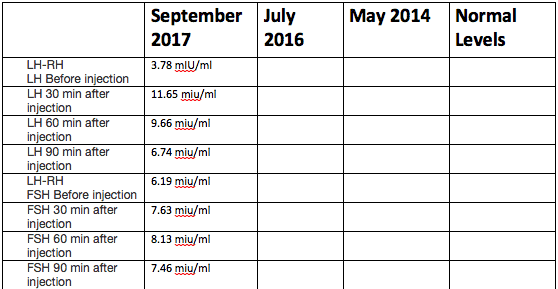 The only thing that changed from the previous test was that I started intermittent fasting (skipping breakfast) and weight lifting since July. As for the hormonal tests, everything came back normal. Thyroid was also normal (though I’ve never had issues with it). With PCOS, you usually have a higher LH than FSH, but the FSH was slightly higher than the LH (which is good). The doctor said the LH-RH test came back with no problems at all. My male hormones (and insulin) were also completely normal which explains why my facial hair isn’t growing much anymore (currently doing electrolysis once a month for 30 minutes). 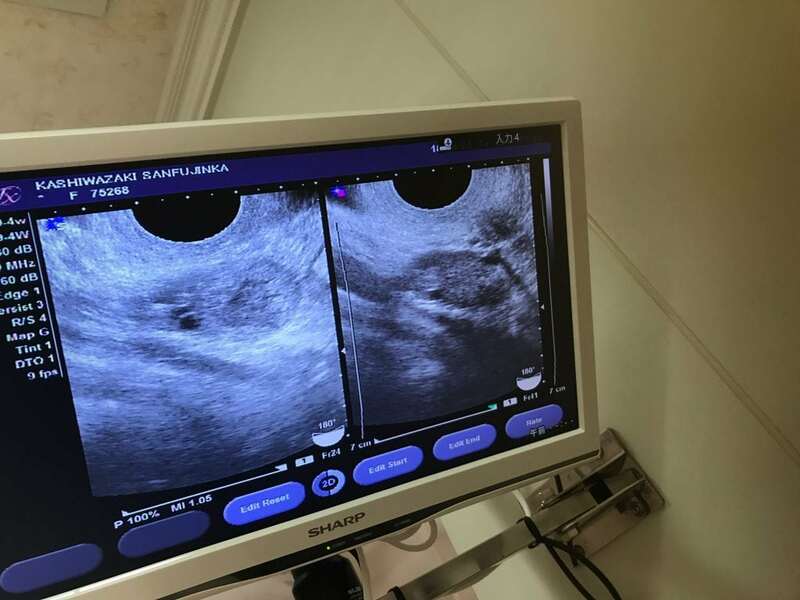 After taking an ultrasound and looking at the blood test results, the doctor asked me: Are you sure you have PCOS? I had to show him my test results from Canada because he couldn’t believe I did in fact have (or had?) PCOS. He asked me to come back a week later to see if I actually ovulated or not. So on September 22, I went back in for an ultrasound and it looked like my right ovary had ovulated so we took a blood test to confirm. He then asked me to come back a week later to get the blood test results. 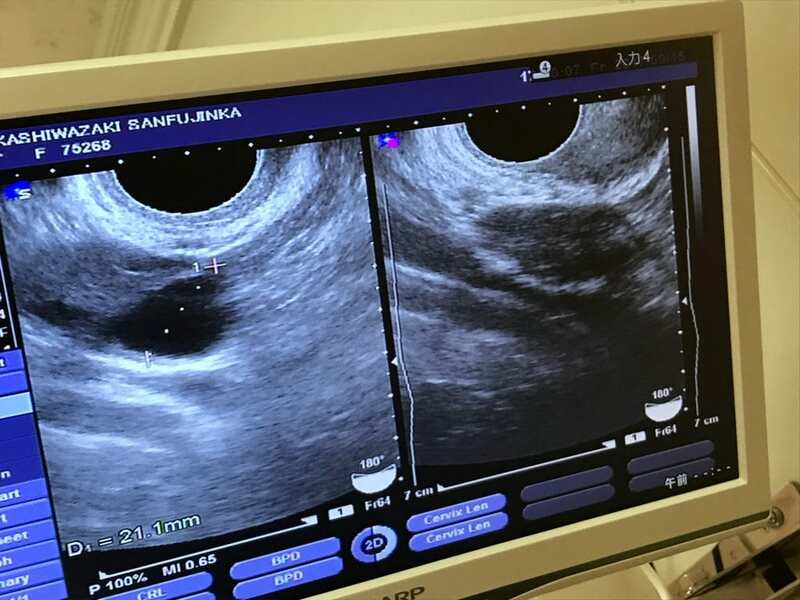 The left picture is my right ovary showing that the previous main big follicle had burst confirming ovulation. The right picture is my left ovary with no cysts/follicles again. I actually took my BBT this cycle and used LH ovulation strips to see if I was ovulating. On cycle day 12, I took the first ultrasound that showed one dominant follicle about to get released. 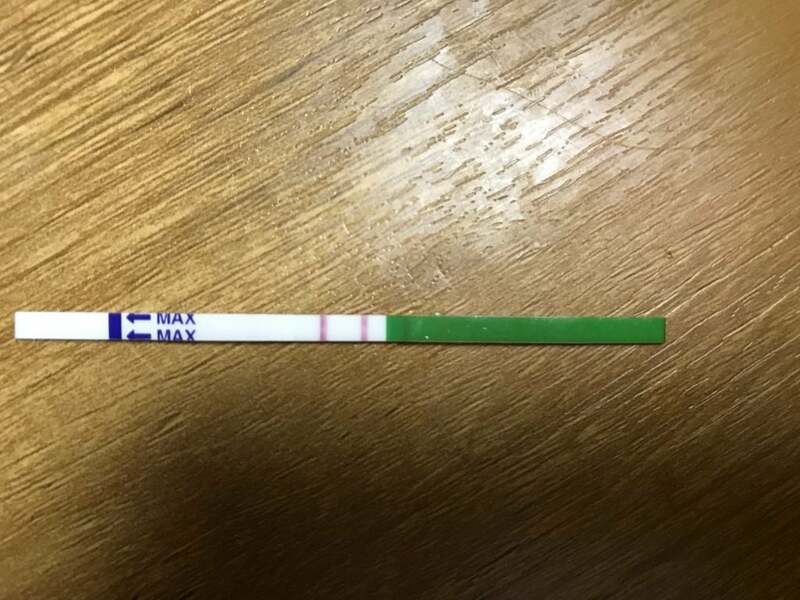 On cycle day 14, the OPK came back positive which meant that I would ovulate soon. On CD 17, my BBT also increased. CD 19 is when I went to get that second ultrasound and showed no more follicles, meaning I had ovulated. On CD 19 and onwards, I had tender breasts meaning my periods would start soon. On October 2nd, I got my periods which means my cycle was 28 days. That is the first time in 2.9 years! It may have been from the side effects of the LH-RH injection, I’ll see next month how long my cycle is. 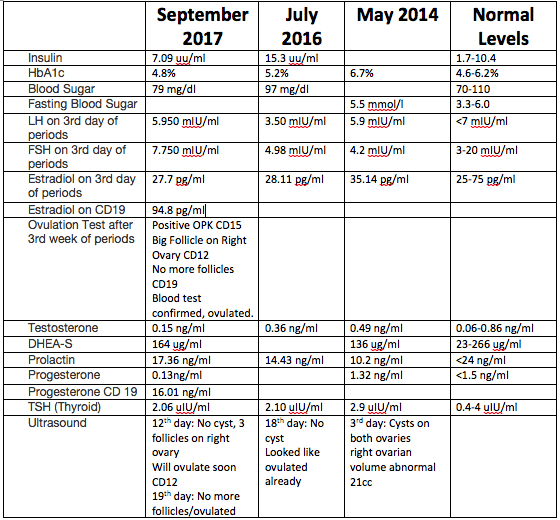 On October 3rd (CD2), I went back to get my blood test results to see if I had indeed ovulated. And I did! My progesterone levels were 16.01 and estradiol 94.8. He said if the progesterone was more than 6, then it meant I had ovulated. I also wanted to include this chart. In this chart you can see what days and how long my periods were every month, the length of the cycles, my weight, and how many hours or minutes of electrolysis I had done on my face. As you can see my periods were initially in the longer days from 31-38 days, but have slowly become shorter cycles with my latest being 28 days. My weight has also slowly been coming off every month, sometimes I stall, but I usually lose. After the appointment today, the doctor said everything looked okay and I should be able to make a baby (from looking at the test results), but alas that will still be a while. We are not ready and simply not there yet. But at least I know that I’m perfectly healthy right now! 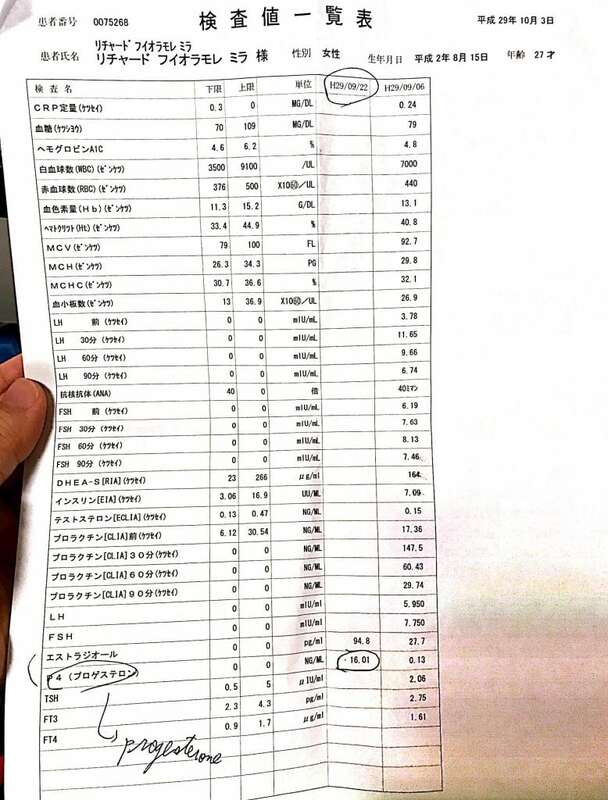 Here are the test results from the hormone panel in JAPANESE haha. I translated everything in the pictures above. I will continue to give it my best this coming year and I’ll post another update next year with hopefully even better cholesterol results!! Thankyou for sharing your story. It’s so wonderful to hear your healing journey. I’m based on Indonesia and last year was diagnosed with POCS. In addition, I was also diagnosed with an autoimmune disease called ankylosing spondylitis. So it’s kind of complicated for me. But having those two in my mind, force me to exercise regularly and eat more healthy foods. I do my blood check on LH, FSH, testosterone, prolactin and estradiol after 3 months of first obgyn visit and it turns to be normal. thank God. My menses also get more regular, even though it was not 28-35 days cycle. Around 40ish days cycle but still, I really thank God for that. I’m based from Singapore too like Veronica. I chance upon your article while trying to read about PCOS and ovarian cyst. I find your article so inspiring. Here’s a little of my own story. I was diagnosed with PCOS in 2016 (was 29 yrs old and was married for 3yrs then), my menses was irregular ever since I was a teenager. Thought it was normal back then. TTC with difficulty then I found out I had PCOS in 2016. Did everything i could, loose a few kg, fortunately my sugar level was normal. Started on birth control to regulate my menses and the Doctor started on Clomid (in dec 2017) to induce ovulation which didn’t work too. So i worked on loosing weight again, successfully lost 6kg and started eating healthy. But didn’t do anything for me, which means no regular menses nor ovulation. Decided to take the IVF path earlier this year. In March this year went for US scan, dr found a right ovarian cyst which was 4.5cm, that was after the Clomid cycle in December 2017. Gave me some pills for 1 month hoping to dissolve the cyst but it didn’t. I proceed with IVF in April with the Dr’s consent (he said it was safe). I did successfully got pregnant in Aug 1 after a long and tiring journey, then had a miscarriage in Aug 14 at 6Weeks5days. I followed up with my gynae after the miscarriage. then found out my cyst already grew to 7.5cm. The doctor did not want to do any invasive surgery (this was at a government hospital) knowing my cyst was there. They just said that it contains fluid and nothing more. He wanted to see me in Nov after 2 months to see the progress of the cyst. I was devastated. I wanted to have a baby. But I can’t proceed with another cycle of FET because of the cyst. Dr offered me pills AGAIN to see if it will dissolve the cyst. DH was upset and didn’t want me taking anything else. Me and DH decided enough was enough. So we went ahead to get a 2nd opinion at a private medical centre in early October. Immediately had the cyst removed on 9th October 2018 (which was recent). Dr said i could lose my right ovary if I did not do this early. The doctor in private medical centre also told me it was not a normal cyst, but dermoid cyst. So now I’m back at my normal self, which is PCOS on both ovaries but no more cyst. My point of the whole story is. I’m trying to conceive naturally if possible. I find it inspiring knowing that we (women with PCOS) could ovulate without taking pills. I really want to heal this. I wish everyone here the best. I came across your Facebook page and started following a couple months ago. I just sat down with my morning coffee and read about your your journey. 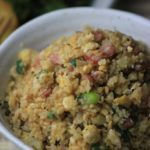 I have to say that it is the first time in years that I felt that someone else understands exactly what I am feeling and going through – from the carb cravings that never really go away to the lack of self confidence and self-esteem that comes with the excess weight gain, facial hair, etc. 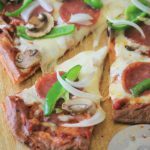 Thank you for sharing your story and your recipes. I was diagnosed with PCOS almost 10 years ago. I was told that I would never lose my excess weight and that I would eventually be diabetic. I was devastated. About 3 to 4 years ago I started the Atkins diet and had a lot of success I lost almost 100 pounds and came within 15 pounds of my goal weight of 150 lbs. However stress has played a big factor in my life the past couple of years caused by a second divorce. I have “fallen off the wagon” so to speak and am really struggling to get back on. The more weight I gain, the worse I feel and the more carbs I crave. My periods has become irregular again, my facial hair is getting worse and I feel horrible about myself. One obstacle for me being low carb and gluten free is that I cannot eat almonds or the almond meal flour. Actually most nuts I can only eat very low amounts of once in a while or I am in complete digestive distress. Anyway, thank you again. Today for the first time I am feeling hopeful that I can get “back on the wagon” and put my PCOS back in remission and lose the weight I have regained. Hi I’m from Singapore and I am so glad I came across your blog randomly!! I didn’t know PCOS could be ‘cured’. I’m almost going to take high cholesterol pills. Unfortunately I’ve started on Yamine OCP. Thank you for blogging I’m so happy I have tears in my eyes. Thank you so much for all that you’ve written! Please continue writing! Good to read your article. and I’m on keto diet for about 5months. Doctor told me I have to limit my daily water consumption without further explanation. 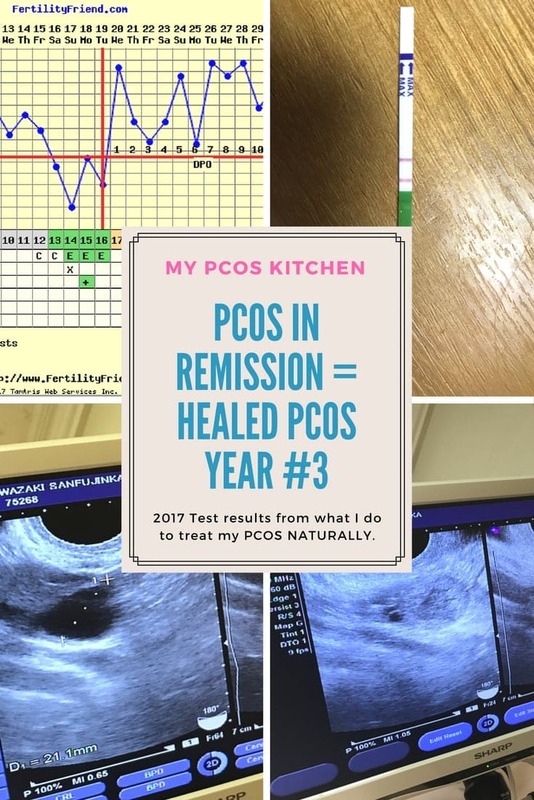 It’s so good to hear that your PCOS have been fixed. if you are staying in Saitama, could we meet up any time between 23rd Aug- 26th Aug? I used to live in Tokyo, and visiting again next week! only if you are okay with it. 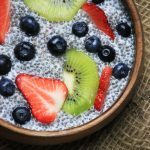 your blog really motivates me to fix PCOS! Hi Doori, I’m actually in Canada for the summer holidays so I won’t be able to meet you, but if you come back to Japan after that, please let me know! i just want to know how old are u?bcoz i am 39 and dheas is 176.i want to know for my age how much it should be.please tell me.my range is below 260.but people are telling it should be low end according to age. Hi Anita, I’m 28 next month. I’m not sure how much you should weigh as age, height and health can factor it. I’m aiming to be 140lbs and I’m 5.4″. This blog is going to save my life!!! 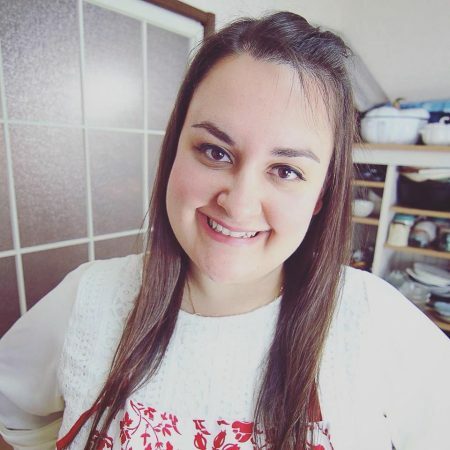 I am 23 years old and have recently diegnosed with PCOS. After my doctor told me I left feeling so defeated, she had no answers for me and told me to take birthcontrol. Being someone who’s never been on it I didn’t want to start. I can not wait to read everything you have written, and start my journey to recovery . Also, just commenting on your thoughts about high cholesterol. I used to consume way to much avocados In a day and that caused my cholesterol to sky rocket. once I cut back a little bit they went back to normal! Hi, I’m just wondering why you said you don’t eat corn, potatoes, beans, or lentils. I think of those as being healthy, especially beans and lentils. What is your rationale for not including them in your diet? I’m curious and always trying to learn how to eat better. Corn, potatoes, beans and lentils are very high in carbs so I don’t eat them. Because I’m insulin resistant and most women with PCOS are, it’s not good for us to eat high carb. When you do, that creates more insulin in your body which makes you gain weight right away, especially around the belly area, and affects your ovaries negatively. This brings up all PCOS symptoms from facial hair, missing periods, cysts, acne, hair loss, weigh gain, etc. That’s why I don’t eat them. I avoid all high-starch, high carb ingredients. Also check out the book The Plant Paradox by Dr.Steven Gundry whose also on Instagram beans are high in lectin which is very bad for your body. Turns out not all plants veggies fruits nuts are good for our digestive track and are high in lectin. This book is amazing and has great recipes too. He akso taljs about insulin resistant foods. I also like trim healthy mama these 2 sisters are great also on Instagram. their recipes also help not to spike our insulin levels. Im also diag with pcos and have been trying to lose weight for yrs. But just now realising its my pcos. So im very glad i came upon your sight and im now following you on Instagram. Good luck and your very inspiring thank you!